Southworth Sailor: Another boat - you've got to be kidding! Montgomery Dinghy, a photo by Southworth Sailor on Flickr. It seems that I had just recently rid myself of all unwanted boats and I was going to be content with my Montgomery 17. Actually there are many reasons for my recent purchase. I have often wanted a rowboat for those calm evenings when the water beckons, but there is no wind. 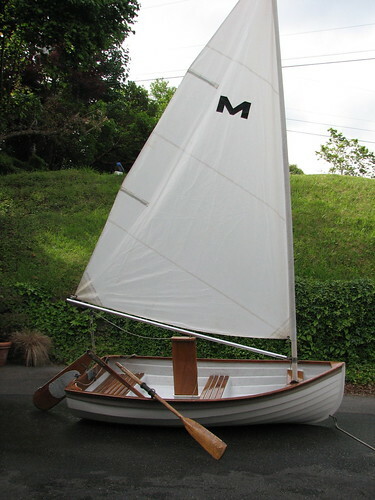 I would also like a little sailing dinghy for winter sails or distant lakes. In addition, when cruising with my M17, it would be nice to tow a dinghy. I have been keeping my eye open for a reasonably priced Minto dinghy which is rich in local history. Last week I came across this dinghy for sale in Port Townsend. It was made by Montgomery just like my 'big' boat and was also designed by the same legendary designer, Lyle Hess. I had never seen one of these available, so I had to at least check it out. A deal was negotiated, and I find myself in possession of another classic Monty. I am anxious to test it out.